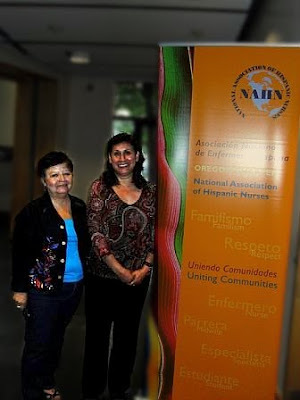 Last week, the Oregon chapter of the National Association of Hispanic Nurses was pleased to have Angie Millan MSN, RN (President Elect NAHN National Organization 2010-2012 and current President, NAHN-Los Angeles Chapter) as an honored guest at their monthly meeting. OR Chapter President Maria Elena Ruiz PhD, RN, FNP-BC began with an inspiring presentation, "Listening to the Voices of Latino Nurses in Oregon: Findings from the Leadership Development Workshops-Latino Nurses in Oregon Speak Out". It was clear from Dr. Ruiz's findings that Oregon Latino nurses are committed to uniting and providing the necessary support, role modeling, and mentoring necessary to empower each other, in addition to lending a voice for Latino issues. 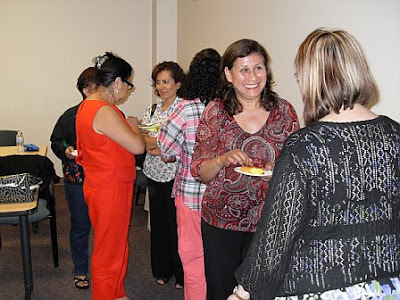 A good portion of the meeting was spent on discussion of health promotion events geared toward the Latino population in Oregon and Los Angeles, CA. Ms. Millan shared that the upcoming annual nursing conference planned in LA would include speakers from the March of Dimes to help educate nurses about what services are available that would be beneficial to children and families they are caring for. The IX Annual Bi-national Health Week taking place October 2-15, 2009, a large scale multi-national health campaign targeted at the Latino community to promote physical activity and healthy eating habits, was also discussed. The goal is to bring awareness and focus to some of the most critical health issues and health disparities that have a significant impact on this under-served group. The National Association of Hispanic Nurses endorsed the Office of the National Nurse initiative earlier this year. The Board of Directors of the National Nursing Network Organization is honored to have their support. Here is a statement from the letter received from President Norma Martinez Rogers Rogers PhD, RN, FAAN, "The National Nurse would provide a visible nurse leader to advocate for enhanced prevention efforts for all communities. Further, we recognize the potential of having a National Nurse who would be able to meet with health care leaders to highlight health disparities and bring forward new ideas." The National Nursing Network Organization would like to answer some questions we have heard in regards to the Office of the National Nurse initiative . Please also visit our Frequently Asked Questions for more information about the proposal. How would having a National Nurse actually help nurses become volunteers for prevention in their own communities? This is a very important question, because engaging trusted healthcare providers will help shift our nation to initiate and value prevention. The answers may lie in the value of having a highly visible and trusted public figure leading prevention, a National Nurse, who will publicly encourage, acknowledge and reward volunteer contributions. The National Nurse will not only guide prevention and suggest focus campaigns, but will evaluate outcomes and publicly recognize successful programs and deserving volunteers. We know shortages already exist in many health occupations, so is it realistic to think there will be a pool of volunteers? Each healthcare provider will determine if, how and when they are able to participate. Nurses, no matter how busy, are nurturing altruistic persons. Nurses often step up to the plate when needed, as evidenced in disasters. Continued invitations from the Office of the National Nurse to seek nurse volunteers will result in more engagement for prevention. Also, the National Nurse will encourage the involvement of recent retirees and students, which will boost the potential pool of volunteer manpower in every community. Students will benefit from varied opportunities for learning, observations and hands-on experiences during community outreach efforts. Retirees can make significant contributions and will be able to remain professionally active, utilize their vast knowledge of resources, and receive continuing education to maintain active licensure. In some community prevention programs, modest stipends might be provided through grant funding to participating providers. What kinds of activities will a National Nurse encourage volunteers to do? Nurses and other providers can contribute to their community prevention programs in many ways. Often they can join existing networks to strengthen effective programs specifically targeted to at-risk populations. They can strengthen education and outreach of established national associations such as the American Red Cross or the American Heart and Diabetes Associations. Some may prefer to work directly where needed with the local schools and colleges attended by their children. Others may become active volunteers for their health department or a Medical Reserve Corps unit. Others may choose to become politically active at the policy level to improve health and environmental conditions in their community. Others may serve on the Board of a local community based organization, or participate in organizing screening programs or community health fair events. As the Office of the National Nurse accumulates data on best practices, the information will be relayed to encourage replication of effective programs. 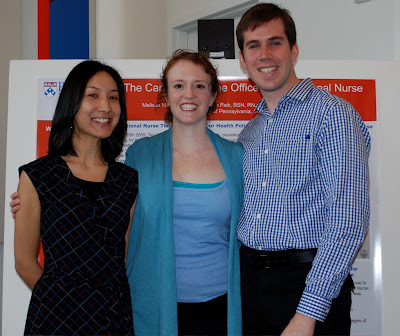 U Penn graduate nursing students Melissa Moore BSN, RN; Grace Paik BSN, RN, and Timothy Sowicz BSN, RN chose to complete a poster presentation on the Office of the National Nurse initiative for their health policy project. In addition, Moore, Paik and Sowicz also wrote an op/ed, "Can One Nurse Empower a Profession"; they contacted their state legislators; and they attended a Lobby Day meeting with representatives from the PA Coalition of Nurse Practitioners and the PA State Nurses Association. The PA Coalition of Nurse Practitioners endorsed the Office of the National Nurse initiative earlier this summer. 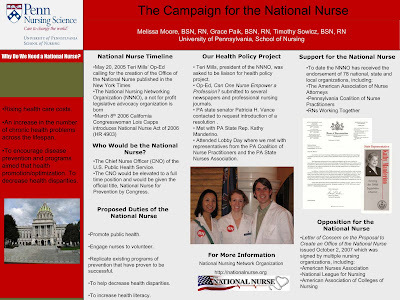 Timothy Sowicz shares, "This year long legislative project that my classmates and I worked on to promote the Office of the National Nurse has given me insight into the need for the shift that must occur in our health care system: Disease prevention and health promotion must be the priority for every provider! A National Nurse is the ideal person to lead this initiative since these two principles are fundamental to the profession of nursing." These students join their peers from universities and colleges around the country who have studied the ONN initiative. This list includes but is not limited to UC Irvine, University of Michigan, University of San Francisco, Concordia University (Portland, OR), George Mason University, Portland Community College, Molloy College (NY), Mt Wachusett Community College (Gardiner, MA), CA State University Long Beach (CA), and OR Health Sciences University. 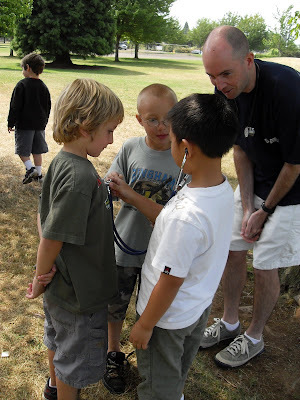 Last week the Portland Community College chapter of the National Student Nurses Association, demonstrating their dedication and support for an Office of the National Nurse, led a healthy heart promotion activity with 23 elementary school children ranging from 5-9 years old who were attending a summer camp in a local park. 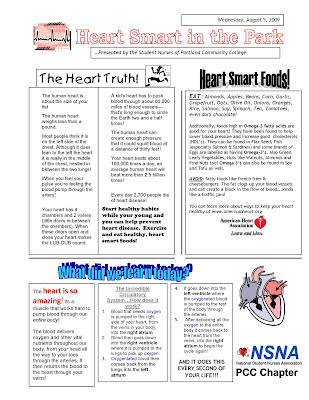 The students chose the heart to focus on because starting healthy habits during childhood can help to prevent heart disease as an adult. 1. A demonstration of the HEART pumping BLOOD to the LUNGS to pick up OXYGEN to be delivered to the body. The students drew large pictures on poster board or cardboard of the HEART, BLOOD CELL, LUNGS, O2, and then had the children act out those: the "blood cell" walked from the "heart" to the "lungs" and picked up an "O2" who then delivered the "O2" to the body and go back to the "heart". 2. Circulation demonstration: Here the kids identified what activities make the heart pump stronger (i.e. playing XBOX or riding a bike...etc.). The children were taught how to take their pulse, then the students had them get up and dance with the assistance of music through a PA system. They took their pulse immediately after this activity and reported what happened to their pulse! The student nurses then demonstrated how a blood pressure is taken. 3. The third booth helped the kids to identify foods that are Heart Smart: Here a discussion took place on how/why some foods are bad for heart and some foods are good. Then the kids played a "What's better game....."
A. French Fries? or B. Apples? Pictures of foods were held up and the kids shouted out which one is better. Every child who participated received a copy of this handout along with a goodie bag that included age appropriate materials from the American Heart Association. 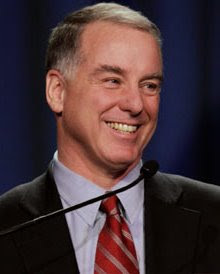 Few can rival Governor Howard Dean (VT) when it comes to achieving meaningful health reform. During his tenure as Governor of Vermont, he oversaw the expansion of Dr. Dynasaur, a program in Vermont that makes universal health care available for children and pregnant women in the state. The program resulted in the uninsured rate in Vermont dropping to 9.6%, half the national average and helped reduce rates of child abuse and teen pregnancy by 50%. Since his return to the private sector, Governor Dean has remained committed to establishing quality, affordable and accessible health care for all Americans. Governor Dean has authored a book, Howard Dean’s Prescription for Real Healthcare Reform. Dean states, “America must shift from an illness-based healthcare system to a wellness-based model. We must develop a healthcare system that is based on wellness and prevention rather than illness intervention.” These statements are in synch with the Office of the National Nurse initiative. The Vice-President of the National Nursing Network Organization, Terri Polick RN, interviewed Governor Dean last week. Preventive healthcare is a key component in the healthcare reform debate. What are your thoughts on a proposal that would make the Chief Nurse Officer of the United States Public Health Service the National Nurse? In your opinion, would establishing the Office of the National Nurse have any impact on health promotion or on healthcare reform? Governor Dean joins over 75 prominent national and state organizations and leaders who have endorsed the Office of the National Nurse initiative and we thank him for his support.